Moet sê, dis darem lekker om weer “ons” dorp, die see, parkeerplek en stilte vir onsself te hê – ja, ook die verkeer is nou weer ‘n plesier. Nee, ek is beslis nie teen die vakansiegangers nie – inteendeel… die vrolike atmosfeer is uiters aansteeklik. Dis net dat ek as “inkommer” soo.. vinnig bederf het. Minder gejaag, beter dienslewering, beter verkeerbeheer (ja, al is hulle nie in Mosselbaai omkoopbaar nie), oor die algemeen vriendeliker mense en diens (al dink van die vakansiegangers ook nie so nie), ‘n skoner omgewing en sypaadjies, want net alles word goed beheer en onderhou. Daar word selfs elke nou en dan swartsakke vir vullisverwydering afgelewer, en stakings … die uitsondering. Selfs die pad na Knysna is minder van ‘n frustrasie (spoedkameras ten spyt). Al is die geleenthede en geld hier in die Suid-Kaap minder, en al vat dit langer om naam te maak en mense te oortuig en te oorreed, vir ook ‘n plekkie en geleentheid by die see, is vasbyt die antwoord en die moeite werd. 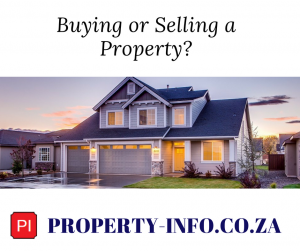 Geseënd is die van ons wat kan uithou en aanhou om dit alles te kan geniet …. alles dinge wat ons nederig en op die knieë hou. Van geniet gepraat…Feestyd in Mosselbaai hou mos nooit op, en dis weer tyd vir die Diasfees. 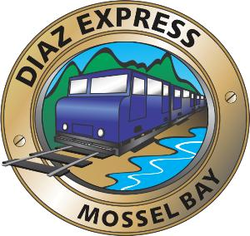 The Diaz Express provides a rail experience run on the existing Transnet rail network in the Garden Route region of South Africa, between the scenic seaside resorts of Great Brak River on the one side and Mossel Bay on the other side. 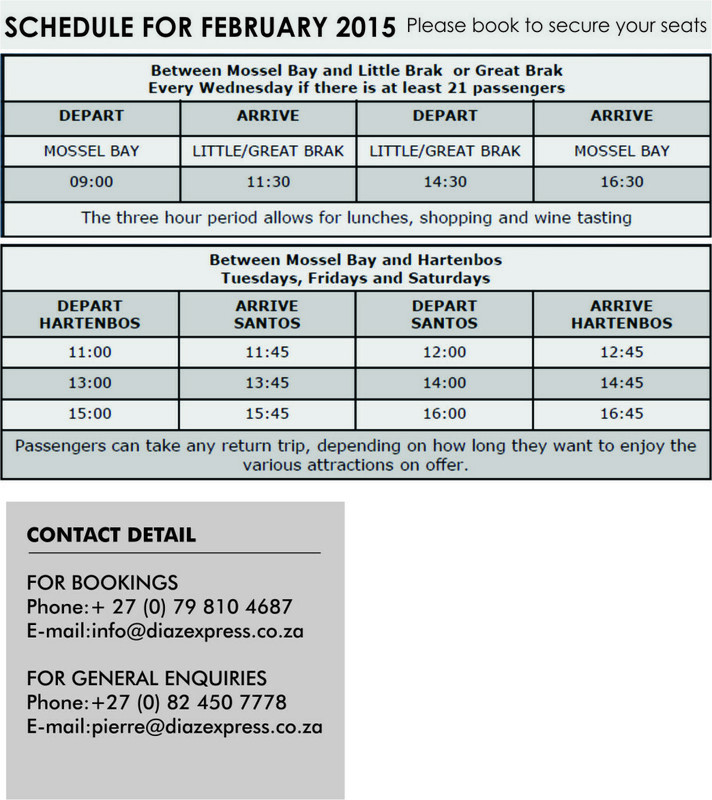 Hartenbos, a popular tourist destination in the Southern Cape, serves as the main point of departure with excursions to a variety of attractions, such as the ever popular Santos beach, Little Brak River and Great Brak River. Performing artists from China, Portugal and South Africa, aerobatics pilots from around the country, and residents of the Garden Route’s favourite harbour town are ready to celebrate Mossel Bay’s annual Dias Festival from the 29th of January to the 1st of February, 2015. 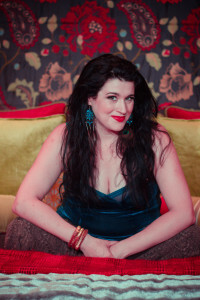 “It’s difficult to single out any one performer or group from our line-up of stars – which includes a band from Germany and guest performers from Portugal and Indonesia, who will appear courtesy of the Portuguese and Indonesia Consuls General – but we’re particularly excited that the Chinese Consul General has arranged for the Zhejiang Wu Opera Troupe to appear at the Festival,” said Mossel Bay’s Municipal Manager, Michele Gratz. The Troupe is famous for its traditional dragon dancing, nimble acrobatics, colourful costumes, and rhythmic music. According to the Smithsonian Institution, Wu opera has “a history spanning more than four centuries” and it “originated in Wuzhou, now Jinhua, in eastern China’s Zhejiang Province… Founded in 1956, the Zhejiang Wu Opera Troupe has both revived traditional works and created new works.” The troupe has performed in countries around the world. (Watch a video of their performance at the 2014 Smithsonian Folklife Festival on YouTube.). Dr. Gratz said that the Troupe will perform in the festival arena at Santos Caravan Park on Friday and Saturday as part of a full programme of entertainment that will also feature Portuguese, Indonesian, German, and South African artists, and will run from Friday morning till Sunday afternoon. “Entry to the festival arena is free of charge, and we’re hoping that the people of Mossel Bay will turn out in large numbers to welcome all our guests,” she said. She noted, too, that a selection of artists will also perform at Langeberg Mall on Friday Morning. The airshow will include fly-pasts by the Harvards of the country’s premier aerial displays team – the Eqstra Flying Lions Formation Team (Scully Levin, Arnie Meneghelli, Ellis Levin, and Sean Thackwray), as well as Patrick Davidson in his World War II Mustang P51 fighter-bomber. “If conditions allow, we’re expecting the Harvards to make a nighttime fly-past on Friday, and, if we’re lucky, a Kulula.com passenger jet will make a fly-past at about 8:45 on Saturday morning, too,” said Dr. Gratz. She added that a commentator will explain what’s happening in the sky via the public address system at the festival arena, and that a team of parachutists will perform a flag jump carrying the flags of the seven nations taking part in the Festival. 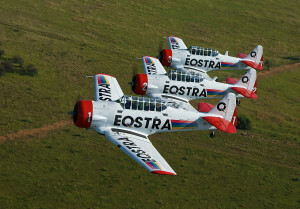 According to Contest Director Jacques Du Plooy, the Western Cape Aerobatics Championships, which will take place at the Mossel Bay Airfield, have attracted three of South Africa’s top pilots: Nigel Hopkins, Mark Hensman, and Patrick Davidson – all of whom have enjoyed podium finishes in the past. “Patrick was SA Champion in 2014, and came third in the World Championships last year; Nigel placed second in the Worlds in 2010, and he was SA Champion in 2013; and Mark is also a past South African Champion,” said Mr. du Plooy. He said, too, that the competition will be judged by a panel of international judges led by John Gaillard, the vice-president and chief judge of the International Aerobatics Commission (CIVA) and the vice-president for the Africa region of the World Air Sports Federation (FAI). Pilots from as far afield as Cape Town, Bloemfontein, and Johannesburg will take part in the competition, which will be flown in the Sportsman, Intermediate, Advanced, and Unlimited Classes. “Entry to the airfield will be free of charge for any member of the public who is interested in the sport of aerobatics, and there’ll be plenty of us there who’ll be delighted to meet you and explain to you what it’s all about,” said Mr. du Plooy. Dr. Gratz said that the Festival’s traditional fireworks – pyrotechnics – display will take place at the Festival arena at 8:00 p.m. on Friday. 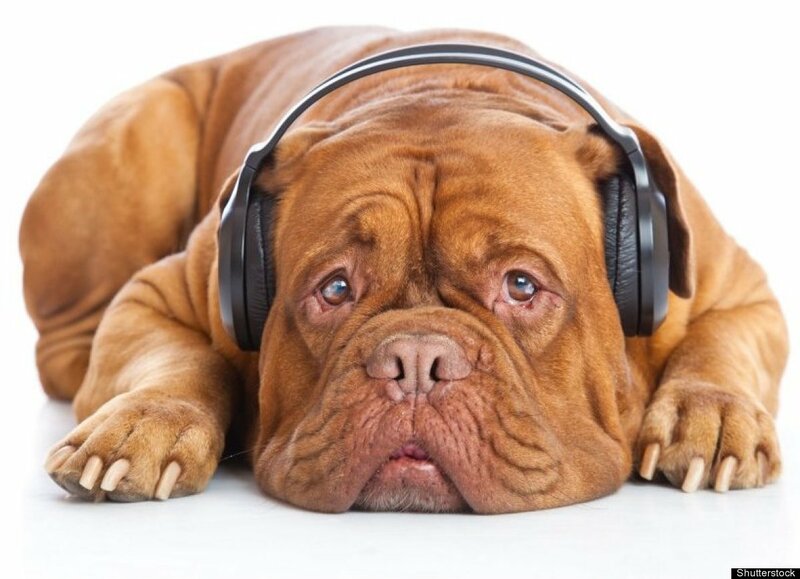 “We’re sensitive to the fact that many dogs don’t enjoy fireworks, so dog owners are invited to collect herbal tranquilizers free of charge for their pets from our sponsor, the Santos Express Train Lodge, on Santos Beach,” she said. Die organiseerders van die Diasfees het besluit om vanjaar ‘n ekstra kultuurbeen by al die ander feesbedrywighede te voeg. 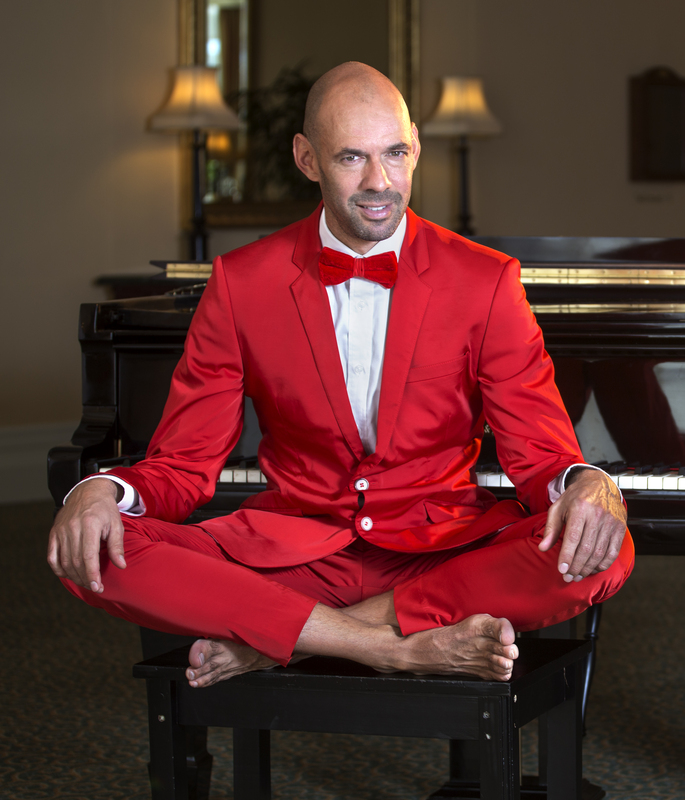 Behalwe die gebruiklike kultuurkonsert wat die fees op Donderdag, 29 Januarie 2015 om 19:30 sal inlei, word daar vanjaar ook twee konserte, een met Emile Minnie en die ander met Zanne Stapelberg, vir klassieke musiekliefhebbers in die Diasmuseum aangebied as deel van die fees. Soos by die res van die fees, is toegang tot hierdie twee konserte ook gratis. Emile Minnie, ster van die kabaretverhoog wie se stem as subliem en se klavierspel as fenomenaal beskryf word, tree op Vrydagaand 30 Januarie 20:30 in die Diasmuseum op. 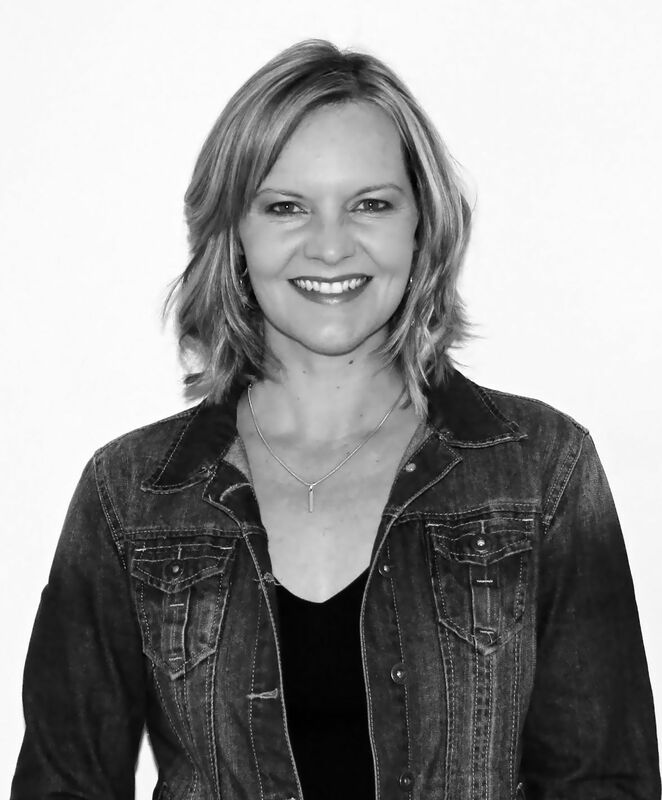 Dit belowe om ‘n aand vol heerlike musiek, pret, humor en ongelooflike liedjies te wees van hierdie man wat gesê word dat hy die hele verhoog met sy energie en humor, sang en klavierspel vul. Die program sal Franse liefdesliedjies soos “La Vie En Rose” van Edith Piaf, jazznommers soos “Cheek to Cheek” van Frank Sinatra en goue treffers soos “Holding Out for a Hero” deur Bonnie Tyler, met dinamiese gehoordeelname, insluit. Dié konsert begin eers om 20:30 om die publiek die kans te gee om eers by die feesterrein in die Santoskaravaanpark ‘n draai te gaan maak vir die amptelike opening van die fees asook, onder meer, die Flying Lions se vertoning in hul Harvards en daarna die optrede van die Chinese kunstegroep, die Zhejing Opera Wu Arts groep, as deel van hulle wêreldtoer. Operaster Zanne Stapelberg, begelei deur Elna van der Merwe, tree op Saterdagaand, 31 Januarie 2015 om 19:30 in die Diasmuseum op. Sy is al bekroon as Suid-Afrika se beste jong operasangeres, en het in 2014 ‘n KANNA-toekenning vir die beste klassieke produksie by die KKNK ontvang. Haar konsert, wat al as hipnoties, verleidelik, flikflooiend en bekoorlik beskryf is, sal bestaan uit ‘n mengsel van nuwe Stapelberg-komposisies met liedere uit die opera, musiekblyspelle en kabaret. Dit sal elemente uit Les Miserables, Karoonag, Maria de Buenos Aires en baie meer bevat. Die gehoor sal kan ontspan met die musiek van Mozart, Piaf, Weil, Amanda Strydom, Nat King Cole bevat – musiek uit straatkafees tot in operasale. The Dias Festival in Mossel Bay has become synonymous with air shows, and fans can look forward to another exciting aerobatics programme at this year’s festival from Friday, 30 January 2015 to Sunday, 1 February 2015. Including the Boeing 737 of Kulula.com, which will do a special fly past over the bay on Saturday, 30 January 2015 as part of the festival, nine different types of aircraft will be on display. Many of South Africa’s leading aerobatics pilots, some of whom are South African Airways pilots, will also be in action. The fly past by Kulula.com during one of their regular flights is a major coup by the Mossel Bay Aero Club, which is organising the airshow. Passengers on this flight will each receive a special certificate of participation in the Dias Festival airshow. The Flying Lions aerobatics will again be in action in their Harvards. Mossel Bay fans can look forward to another one of their spectacular night displays on Friday, 30 January 2015. They will do two performances on Saturday, 31 January 2015. A World War 2 Mustang fighter-bomber, piloted by Patrick Davison, is expected to be another big attraction while the Team Xtreme formation aerobatic display team of Mark Hensman and Nigel Hensman, both flying MX2 aircraft, is also likely to add to the excitement of the airshow. Other aircraft that will be in action are a Yak 55 (Jacque du Plooy), an RV7 (Martin Venn) and a Slick 540 (Neville Ferreira). The programme will again flag jumps during which members of Skydive Mossel Bay will jump onto Santos beach from a C182 with the South African, Chinese, Indonesian, French, Madagascar and German national flags as well as that of Standard Bank, the main festival sponsor. These countries are all either participating in or are represented by diplomats of the countries at the festival. Members of the Mossel Bay Aero Club will also do fly pasts in various aircraft on Saturday, 31 January and again on Sunday, 1 February. 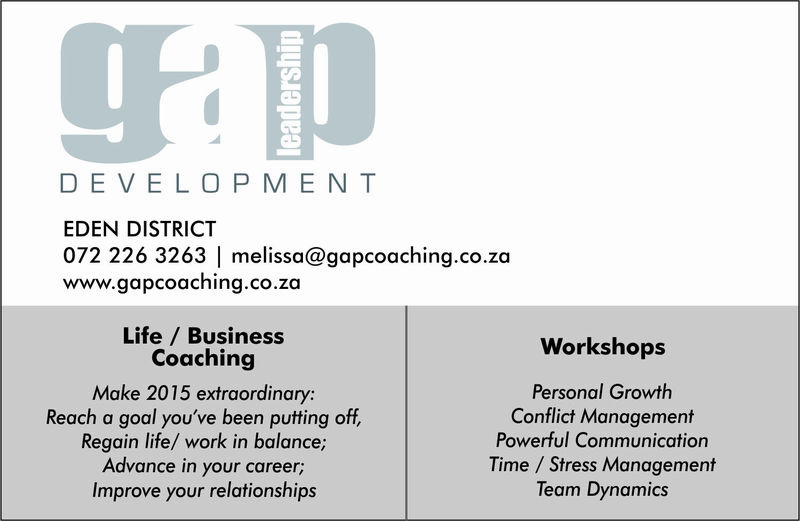 My besigheid se naam is ‘Gap Leadership Development’. Ek het die naam gekies omdat ek mense wil help om die gaping te oorbrug tussen hul huidige omstandighede en die lewe waarna hulle streef. Ek bied opleiding en lewensbegeleiding (‘coaching’). My agtergrond is Voorligting Sielkunde, maar ek is ook ‘n gekwalifiseerde ‘coach’ en het baie ervaring in die aanbieding van werkswinkels. Ek het die afgelope paar jaar vir ‘n privaat hospitaalgroep gewerk, waar ek personeel opgelei en bestuurders se leiersvaardighede ontwikkel het. Die positiewe terugvoer wat ek deurentyd ontvang het, het my laat besef dat ek ‘n positiewe impak op mense se lewens kan maak deur my kennis met hulle te deel en hulle te help om hul doelwitte te bereik. My droom was nog altyd om ‘n praktyk in die Suid Kaap te hê en ek het verlede jaar besluit dat ek alles in my vermoë gaan doen om my droom te bewaarheid. Enigiemand wat daarna streef om hulself te ontwikkel op persoonlike en professionele vlak. Ek spesialiseer egter in die ontwikkeling van professionele vroue. Life/Business Coaching: ‘Coaching’ is maar die mees bekende term. 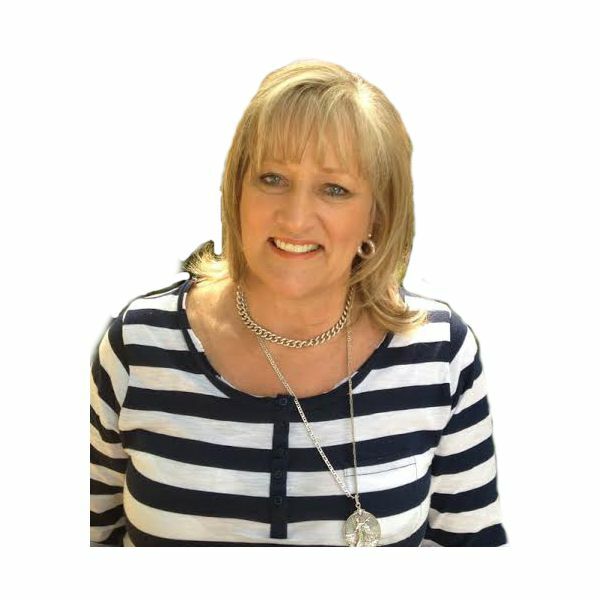 Wanneer jy ernstig is oor ‘n doelwit wat jy wil bereik, maar dit moeilik vind om te fokus, as gevolg van al die eise wat daagliks op jou tyd geplaas word, sal jy baat vind by ‘n ‘life/business coach’. Ek kan jou help om te besluit wat regtig vir jou belangrik is; om te verstaan wat jou in die verlede verhoed het om jou doelwit(-te) te bereik; en jou help om stap vir stap aksie planne uit te werk en tot uitvoer te bring. Opleiding: My werkswinkels spreek verskeie lewensvaardighede aan, soos byvoorbeeld ‘Hoe maak my persoonlikheidstipe my uniek?’ (vir tieners); ‘Hoe om ‘n effektiewe CV op te stel en ‘n suksesvolle werksonderhoud te hê’ (skoolverlaters); ‘Hoe bemark ek myself en my produk wanneer ek netwerk’ (entrepreneurs); ‘Hoe gebruik ons konflik tot ons voordeel?’ (bestuurders en bestuurspanne) en’Unieke uitdagings vir vroue in die besigheidswêreld en hoe om dit te oorkom’ (professionele vroue). As gevolg van my sielkunde agtergrond, het ek heelwat gespesialiseerde vaardighede as ‘coach’ wat bydra tot my kliënte se positiewe ervaring van die proses. My diverse agtergrond en ervaring maak dit ook vir my moontlik om werkswinkels aan te bied wat deelnemers help om hul eie en ander se gedrag te verstaan en, selfs meer belangrik, hierdie kennis toe te pas om hul persoonlike en professionele omstandighede te verbeter. Een van my persoonlike hoogtepunte was die internasionaal erkende bestuurskurses wat ek van 2009 tot 2013 aangebied het en die voorreg om leiers te sien ontwikkel deur die loop van die jaar-lange program. ‘n Sukses was die uitdaging wat ek aangepak het toe ek ‘n pos by ‘n maksimum sekuriteit tronk aanvaar het (2005-2008). Dit het my nie net baie oor menslike gedrag geleer nie, maar het ook aan my bewys hoe aanpasbaar mense onder moeilike omstandighede kan wees. ‘n Persoonlike prestasie was toe ek die eerste uitgawe van Maretha Maartens se boek ‘Moeilike Mense” in die pos ontvang en my naam langs twee hoofstukke in die inhoudsopgawe gesien het. My ervaring en unieke benadering sal my onderskei van soortgelyke besighede. … mens nie moet wag vir ‘die regte tyd’ om iets te doen nie. Daar sal altyd iets wees wat jou keer om die lewe te leef waarvan jy droom. As jy iets regtig wil doen, sal jy ‘n manier vind (..indien nie, sal jy ‘n verskoning vind). ·Unieke uitdagings vir vroue in die besigheids wêreld en hoe om dit te oorkom’. The Indonesian Ambassador, His Excellency Mr Suprapto Martosetomo (third from left) paid a courtesy visit to the Executive Mayor, Alderlady Marie Ferreira (second from right). With them in the photograph are, from left to right, Dr Michele Gratz (Municipal Manager), Mr Joel Rohrohmana (Acting Consul-General and Consul (Economic) (Cape Town) and Mr John Purba (Vice-Consul, Cape Town). 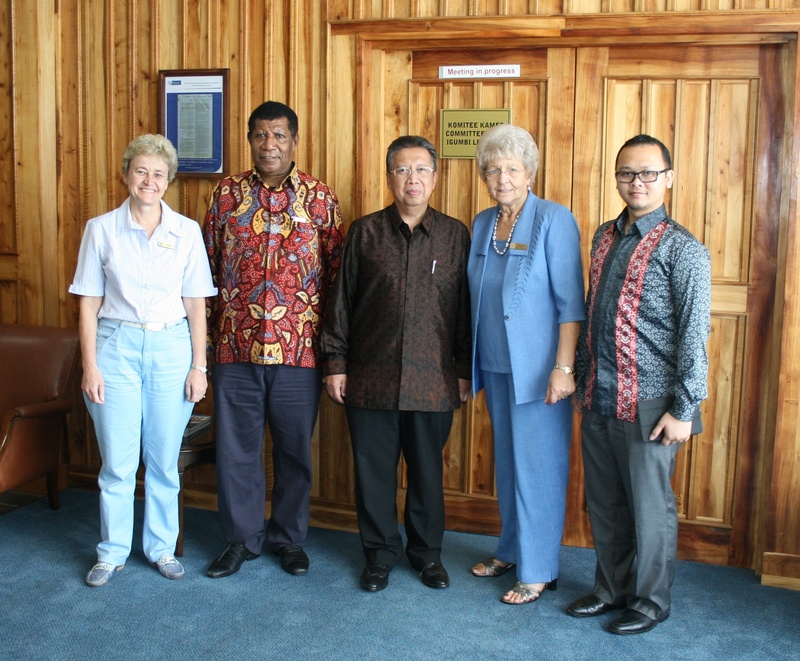 A sister city arrangement with Yogyakarta and Indonesian investment in Mossel Bay were on the agenda when the Mayoral Committee and municipal management met with an Indonesian delegation led by Mr Suprapto Martosetomo, the Indonesian Ambassador in South Africa, last Friday. Mr Martosetomo, accompanied by Mr Joel Rohrohmana, Economic Consul and Acting Consul General of Indonesia in Cape Town, and Mr John Purba, Vice Consul, paid a courtesy visit to the Executive Mayor, Alderlady Marie Ferreira, prior to Indonesia’s participation in the 2015 Dias Festival this weekend. Ambassador Martosetomo raised the possibility of Mossel Bay entering into a sister city arrangement with a city in Indonesia, and suggested that such an arrangement is pursued further with Yogyakarta, a coastal city approximately 500 km south-east from the capital of Indonesia, Jakarta. Yogyakarta, alternatively spelt as Jogjakarta, has a history dating back more than a 1 000 years, several universities and is sometimes described as the cultural heart of Indonesia. Although such an arrangement is likely to focus strongly on tourism, the possibility of investment in other areas of the local economy was also discussed. Mossel Bay’s water security as well as good transport infrastructure was emphasised in these discussions. Ambassador Martosetomo undertook to approach the Yogyakarta city authorities as soon as possible about the twinning arrangement. The Mossel Bay Municipality has built up good relations with the Indonesian Consul-General in Cape Town over the past three years and this will be the third consecutive year that Indonesian folk dancers and performers will participate in the Dias Festival. Their colourful and rhythmic shows were highlights at previous Dias festivals. 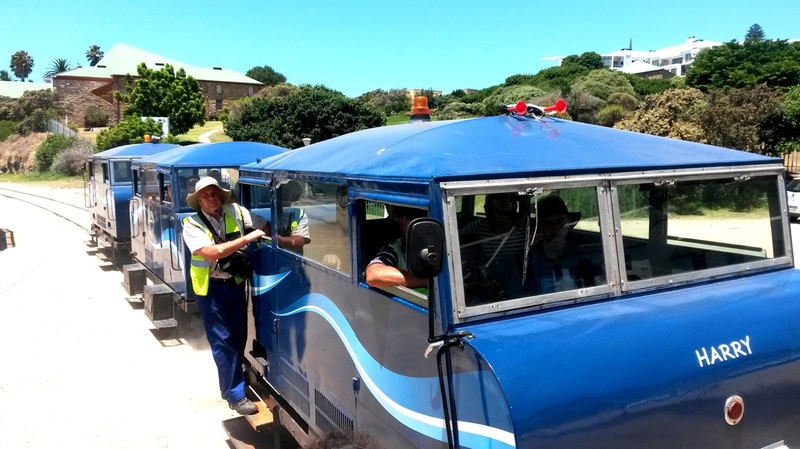 Met die oog op die vuurwerkvertoning op Vrydagaand, 30 Januarie 2015, by die Diasfees word eienaars van honde daaraan herinner dat hulle spesiale kruiekalmeermiddels vir hul diere by die treinrestaurant by Santosstrand kan kry. Die kalmeermiddels word gratis beskikbaar gestel deur die Santos Express, wat ook die borg van die vuurwerkvertoning is. Die vertoning sal ongeveer vyf minute duur. Die Dias Museum vier dié jaar sy 26 ste bestaans jaar. besoekers sal oa deur Portugese dansers vermaak word. Die goeie nuus – toegang vir almal dié dag gratis. Die Museum wat voorheen bekend gestaan het as die Posboom Museum, het oor die jare duisende vakansiegangers en toeriste van regoor die wêreld gelok. Inruil het dit weer bygedra tot ‘n waardevolle ekonomiese groei vir Mosselbaai. The 26th birthday celebrations will start on Sunday, 1 February at 10:30. The public are invited to join. The good news, entrance to the Dias Museum will be free for the day. The Mayor will deliver her address and amongst other things, Portuguese dancers will entertain visitors and guests.